Why the 2013 Audi Q5? I have calculated my gas using the onboard computer a few different times in mixed driving and am getting a consistent 25/26 mpg. That's without hard acceleration or driving above 70 MPH on the highway. 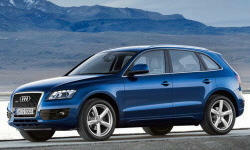 Why Not the 2013 Audi Q5? There are so many tasks packed into the MMI system that it can be a bit confusing to do while driving.